I grew up in the middle of nowhere. My neighbors lived close enough that I could see their houses but far enough that if I shouted, they couldn’t hear me. One had horses, another cows, my own family had chickens, ducks, geese, and goats. Then I grew up. I moved away. I married a city-boy. His career had us in a few different settings: an apartment, a condo, and most recently a 4-bedroom house with a large fenced-in yard overseas. Last year we moved back stateside and, in that move, we downsized from that house into a 2-bedroom apartment. Our apartment complex is located in our state’s second largest city. Suffice it to say my dreams of a veggie garden and a few hens are a ways away. I have learned from our experience living in this apartment that lack of a yard does NOT constitute lack of opportunity to explore and study nature. The biggest step is just walking out your front door. As sad as it sounds, I have lived in my apartment complex for a year, I have seen dozens of children everyday but very, very rarely (read that practically never) have I seen any children, besides my own, playing outside. The only reason I even know these other children exist is because I see them walk from their apartments to their parent’s car, then from their parent’s car back to their apartment. Never do they stop to pick up a stick or examine a leaf. 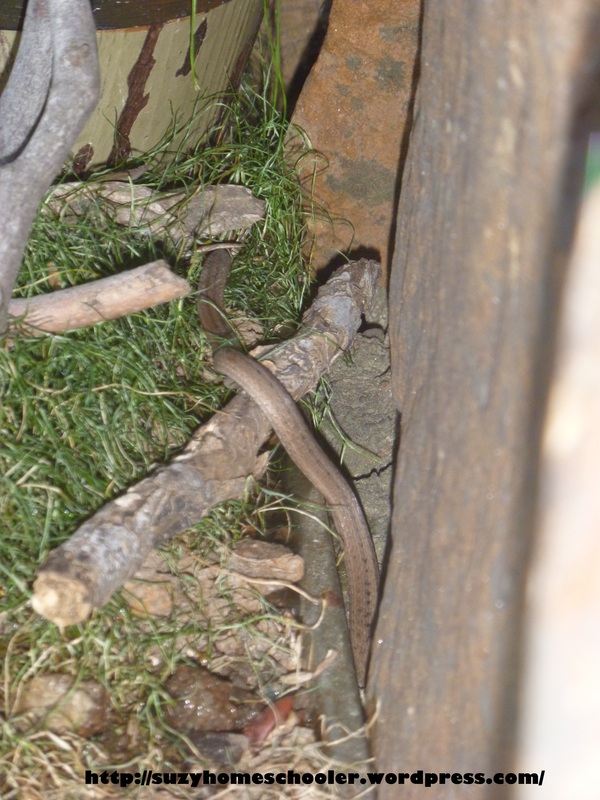 Surely these children spend time at the park or play outside when they visit friends with yards, but they are not taking advantage of the wonderful wildlife we have in our own apartment complex. If you live in an apartment and worry that your children aren’t getting enough time outside then keep reading, I have got some easy and fun ideas for you! 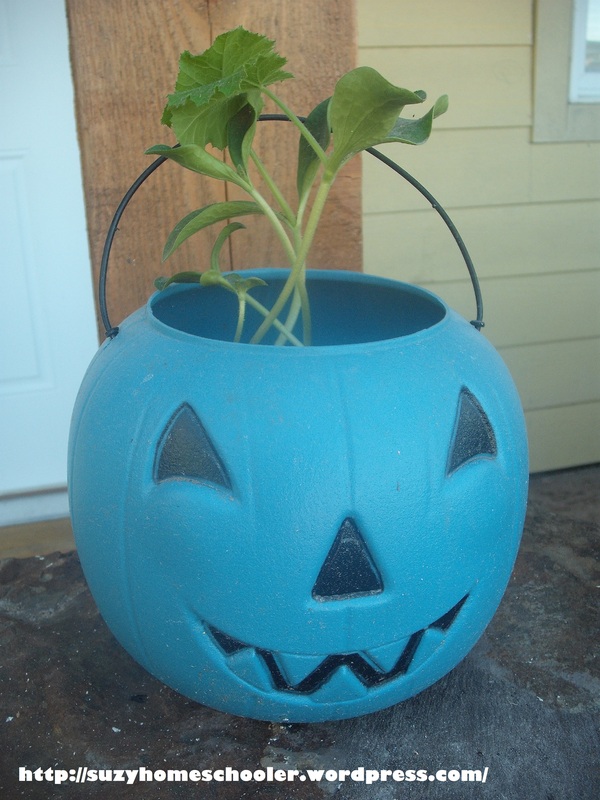 One thing you can do to bring a little nature into your apartment setting is container gardening. 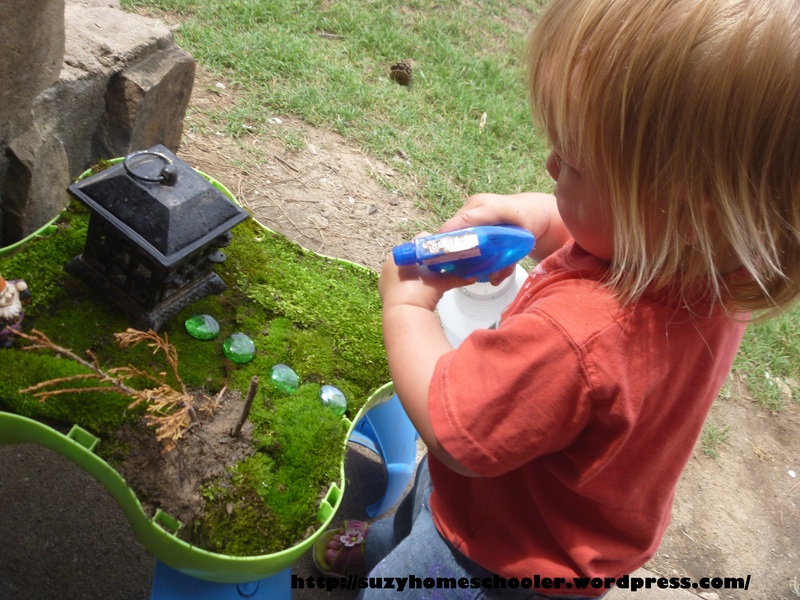 If you have small children, then consider a fairy garden. We’ve had a few fairy gardens- not all of which we have blogged about, though each one has been fun. Besides a garden to stimulate discussion and exploration of plants, you may also want to consider doing things to attract wildlife to your area. 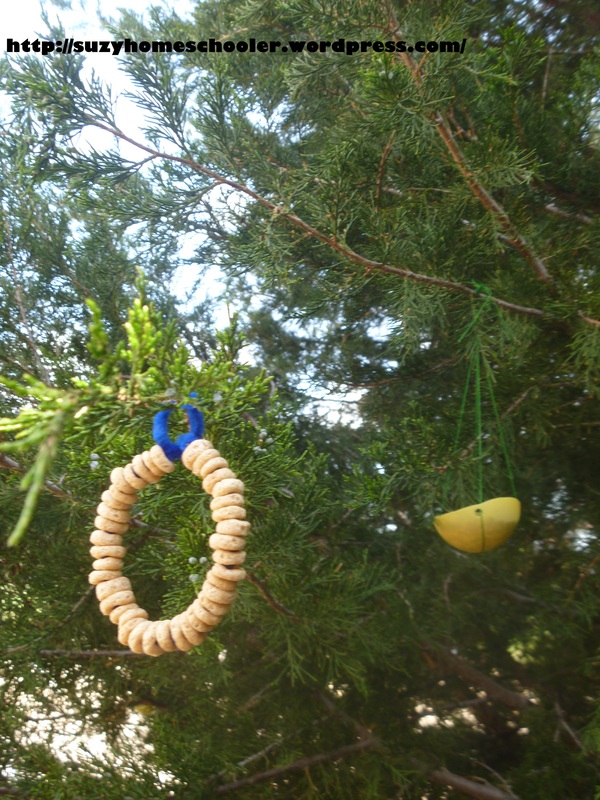 Bird feeders are the most common way to do this. I personally have been itching to create a insect hotel. Even with all your efforts to create an eden on your balcony/patio/shared yard, apartment dwellers will most likely have to walk to find nature. Try not to be limited by weather. 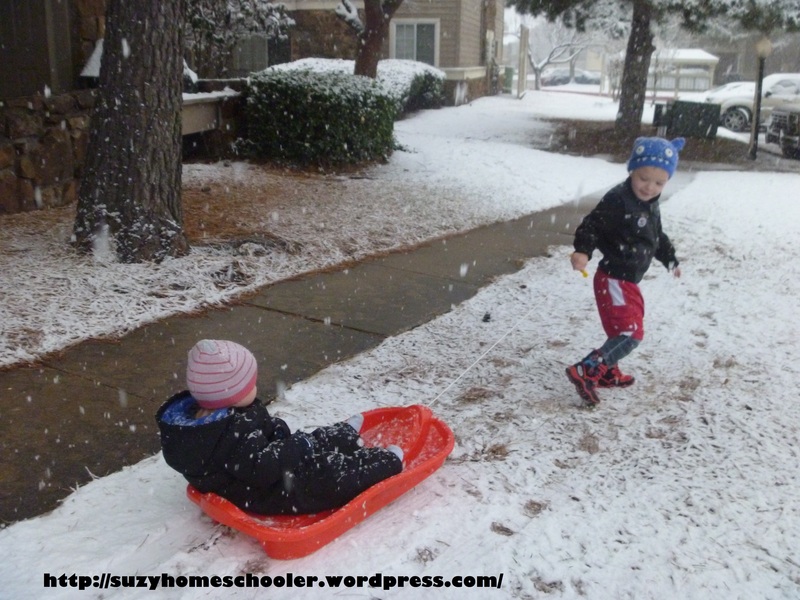 A few minutes of outdoor play everyday is recommended, regardless of snow, rain, or heat. Of course, if you’ve got hurricanes, tornadoes, or freezing rain then you should probably stay inside. But extreme weather aside, there is something to be said for bundling the kids up and letting them experience play in all weather types. It can be easy to be caught up in what you should or should not be doing that sometimes we as adults make a big deal out of things that don’t need to be a big deal. So if you’re outside and your child starts to do something that you aren’t ecstatic about, stop yourself and assess the situation before you stop them. Are they hurting anyone? Damaging property? Causing harm to themselves? No? Can they learn from what they are doing? Yes? Then let them be! 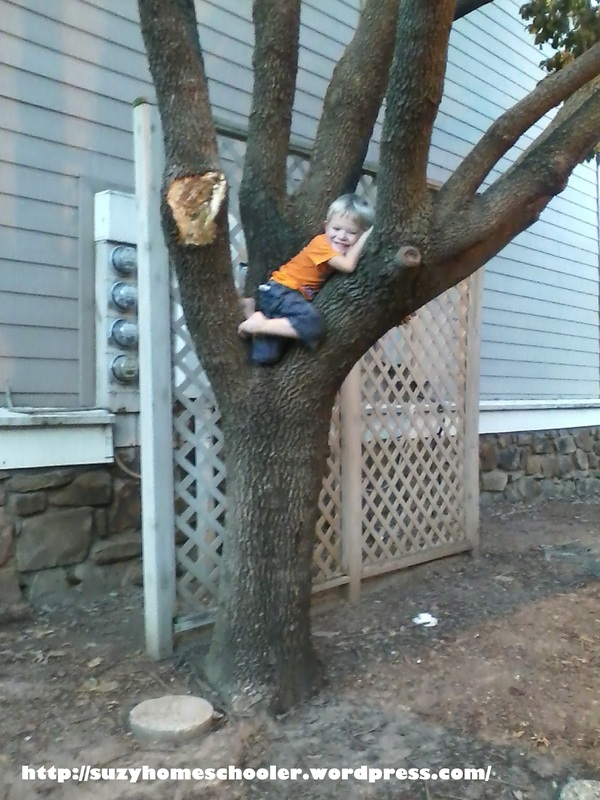 Let them climb that tree. 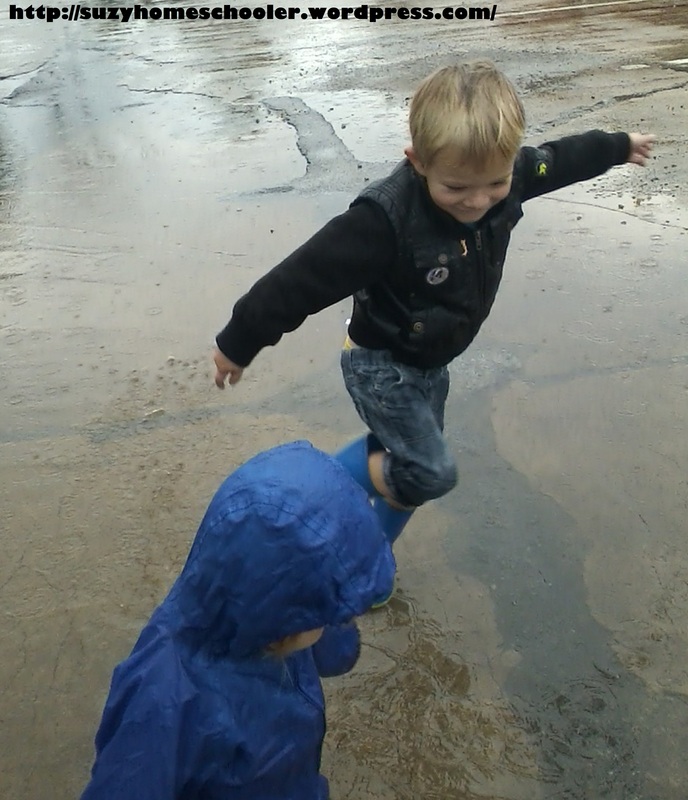 Let them play in that mud. 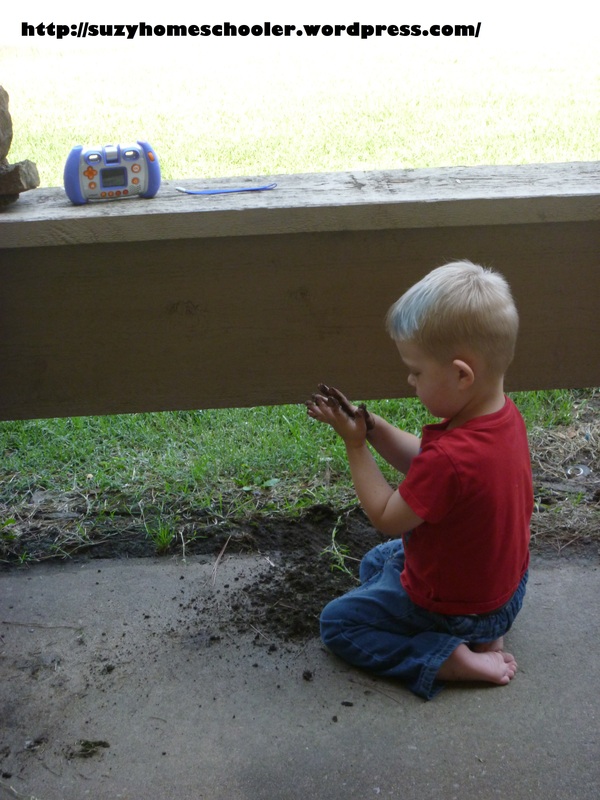 Remember that dirt is actually healthy for children. Finally, when you’re outside, keep a sharp eye out. The most fascinating finds we’ve experienced are the ones that we’d easily miss if we weren’t looking for them! 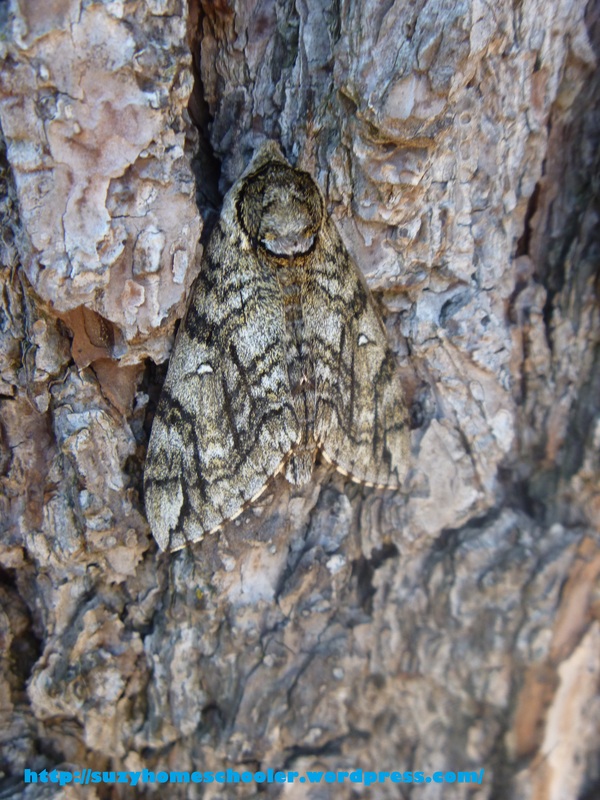 Like this head-to-toe 4.5 inch moth sitting on a tree at my son’s eye-level. 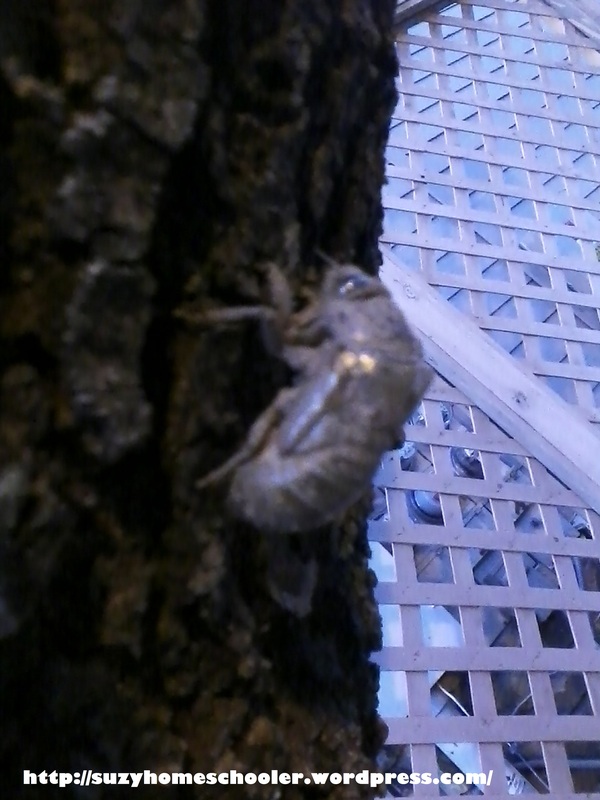 And this cicada exoskeleton we found hanging from another tree just around the corner from our front door. 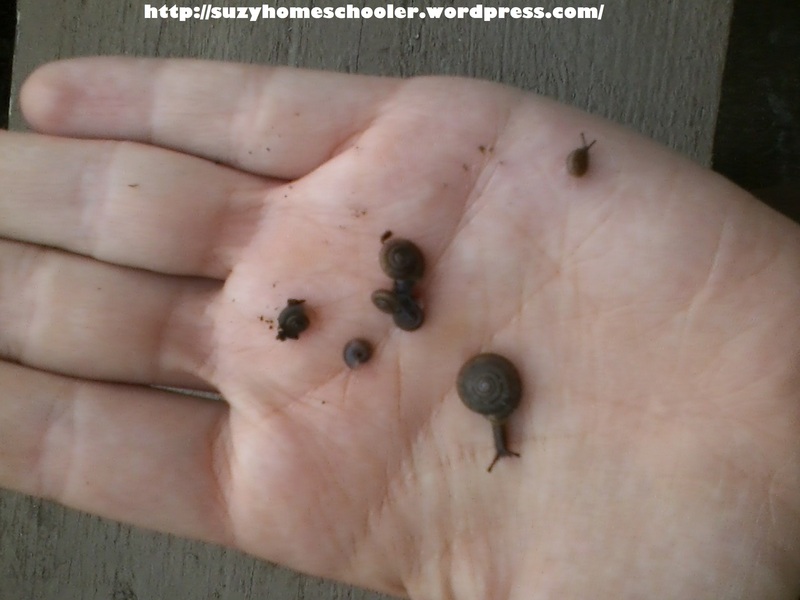 And these teeny-tiny snails that were living in a pile of firewood on our neighbor’s patio. Of course there is something to be said for luck. 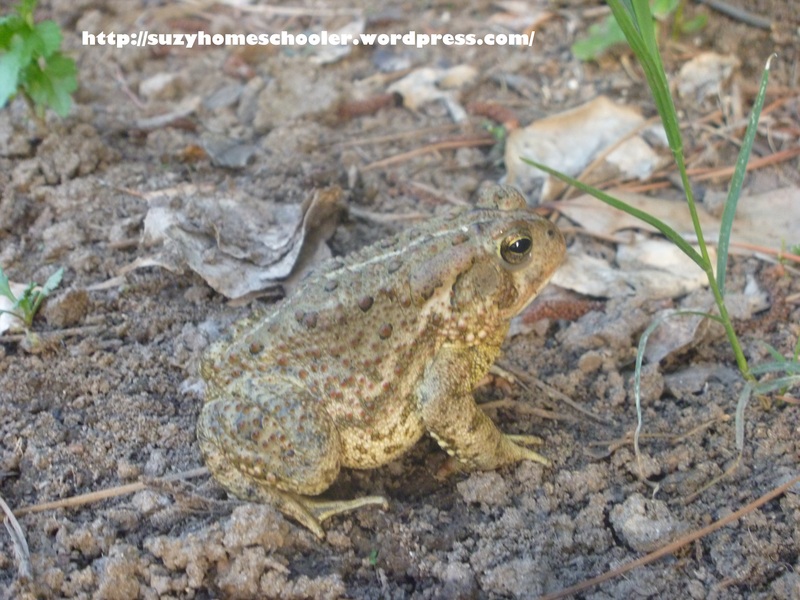 Such was the case when this little guy hopped onto our patio and spent the day with us. When you’ve found something cool, if possible, consider taking it home and putting in a nature table type display. 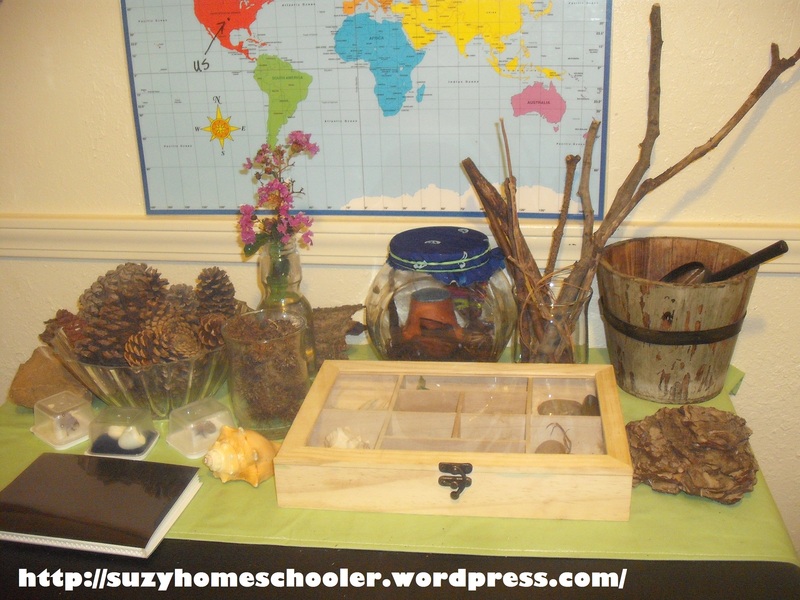 A nature table is something I was inspired to create while reading about the Montessori method of education. Nature tables can be as simple or as elaborate as you want. 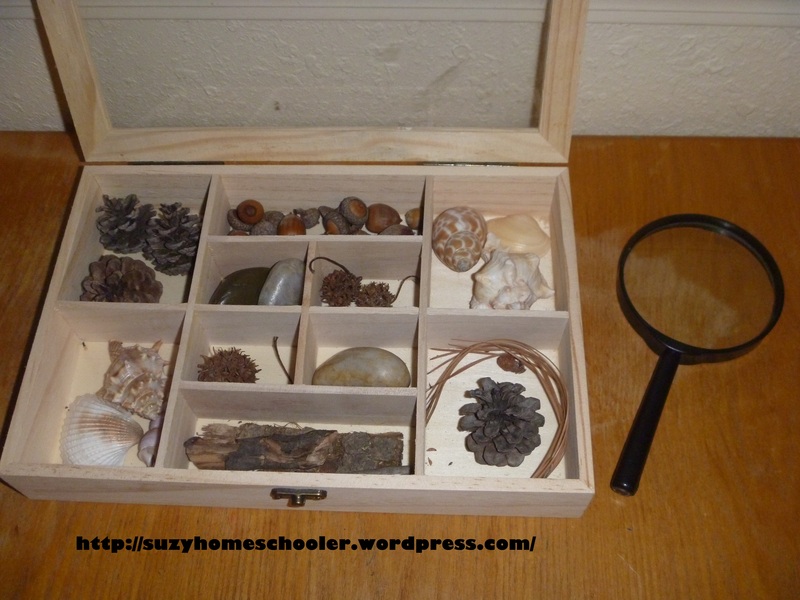 Even just a shoe box of rocks and pressed leaves would probably make an apartment-dwelling child happy. Admittedly, our nature table started out small but grew rather quickly. 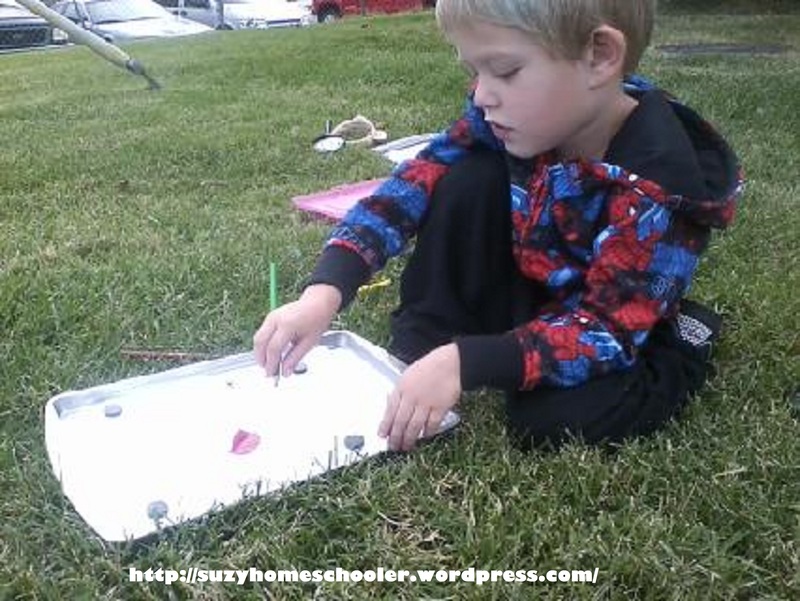 My children are free to explore their nature table whenever they please and we do try to get outside for at least a few minutes of play everyday, but it wasn’t until a couple months ago that I started encouraging LittleMan to keep a nature notebook. 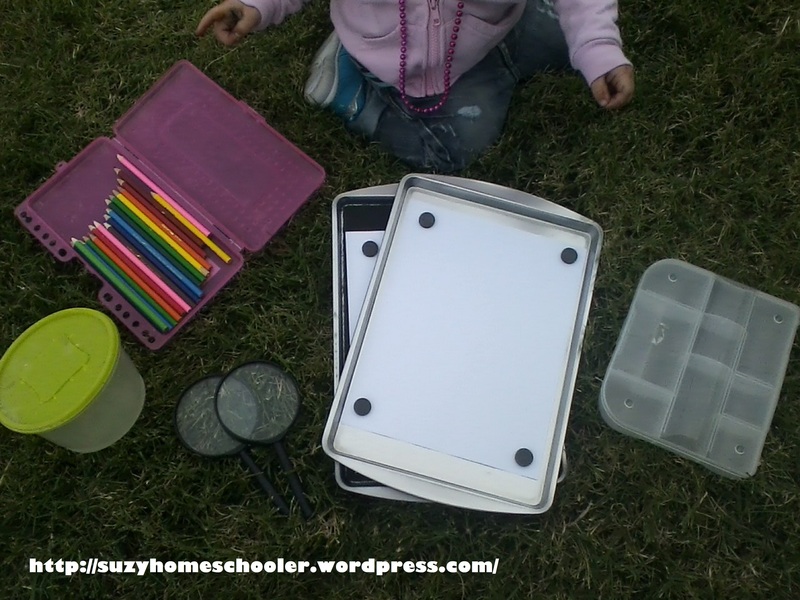 Nature notebooks are a fun aspect of the Charlotte Mason method of education. 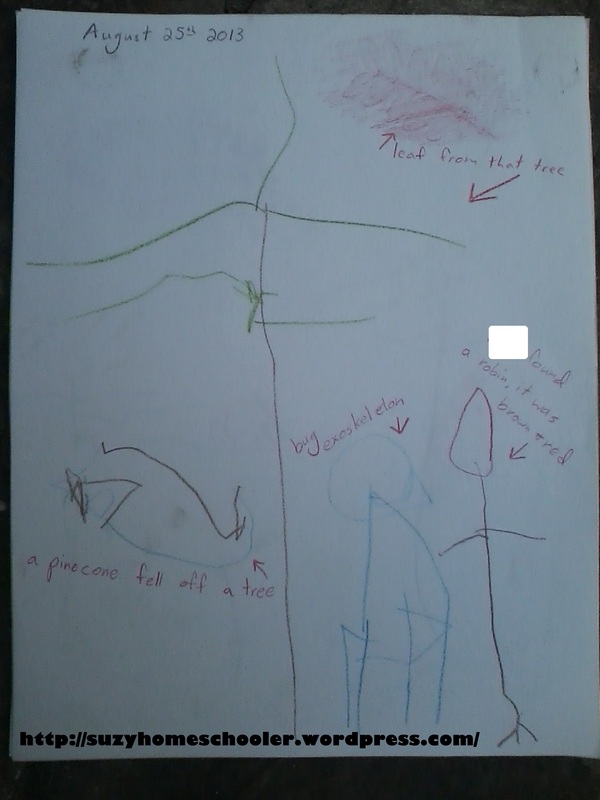 I really feel that LittleMan’s notebooking has helped him to look more closely at the world around him and study the little things he otherwise wouldn’t have noticed at all. 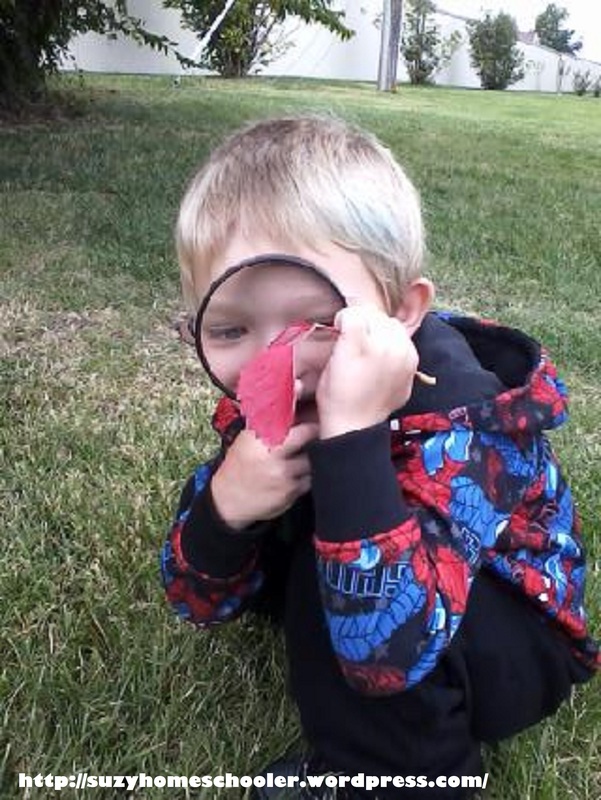 Playing outside everyday has resulted in countless educational experiences, but there is something to be said for going outside with the express purpose to study nature. Every Sunday we gather our materials for a “formal” nature study: paper, something hard to write against, colored pencils, magnifying glasses, a small divided container (you could use an egg carton) for collecting found objects, a larger clear container with holes punched in the lid for insect observation, and two excitedly impatient children. Generally I just lay out the materials and they do the rest. 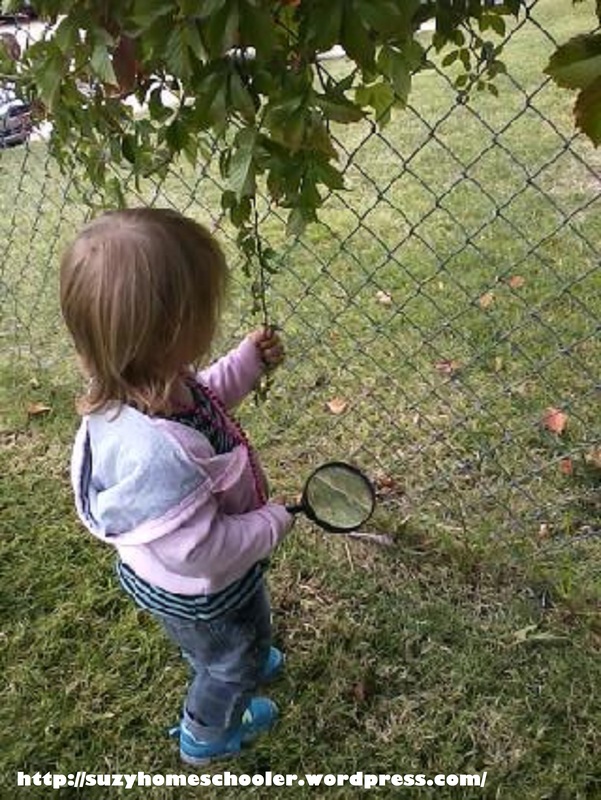 They run around finding things that interest them, observe those interesting things, then draw what they see. When they are finished I write what they say they saw and date the paper. All papers are thrown into a file to be bound at the end of the year. Tree, leaf rubbing, pinecone, cicada exoskeleton, and a robin. 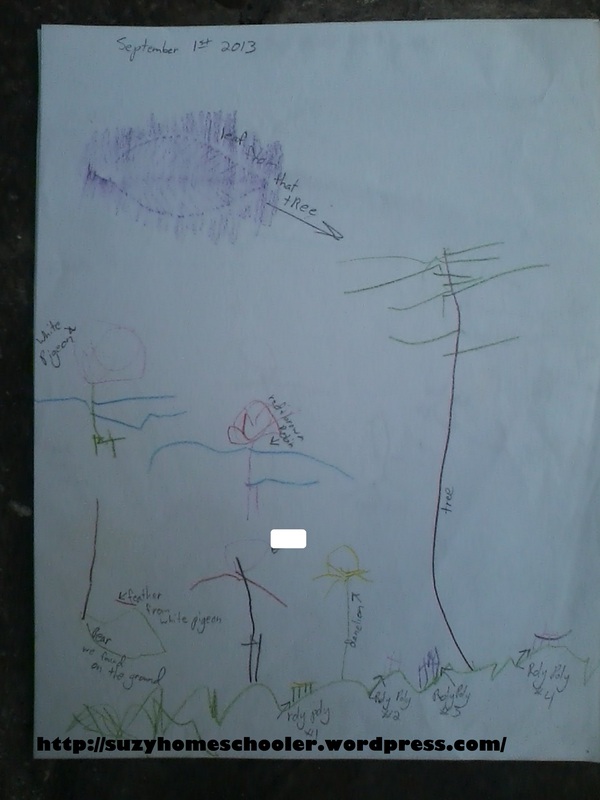 Tree, leaf rubbing, pigeon, robin, dandelion, pill bugs, a feather, himself, and a pear that fell out of a neighbor’s tree. 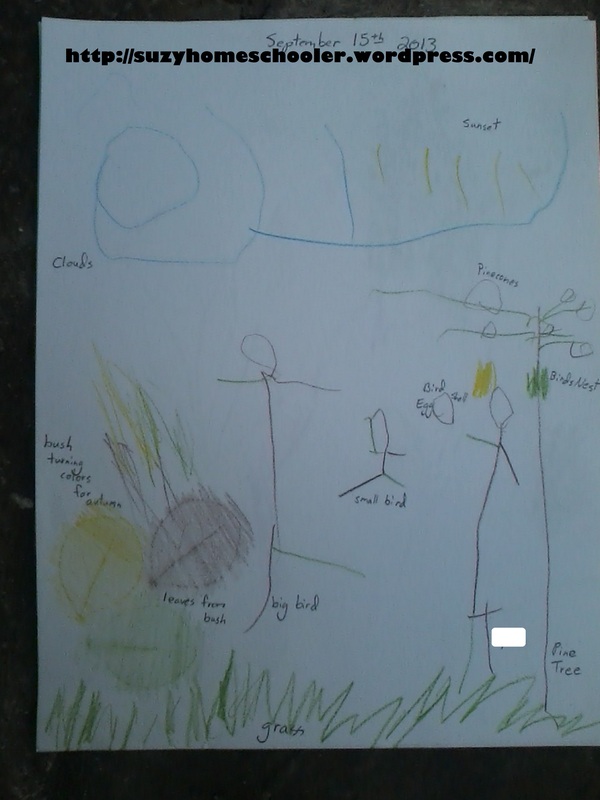 Tree, pinecones, bird’s nest, part of an egg shell we found on the ground below the nest, leaf rubbings, two birds, clouds, himself, and the sunset. 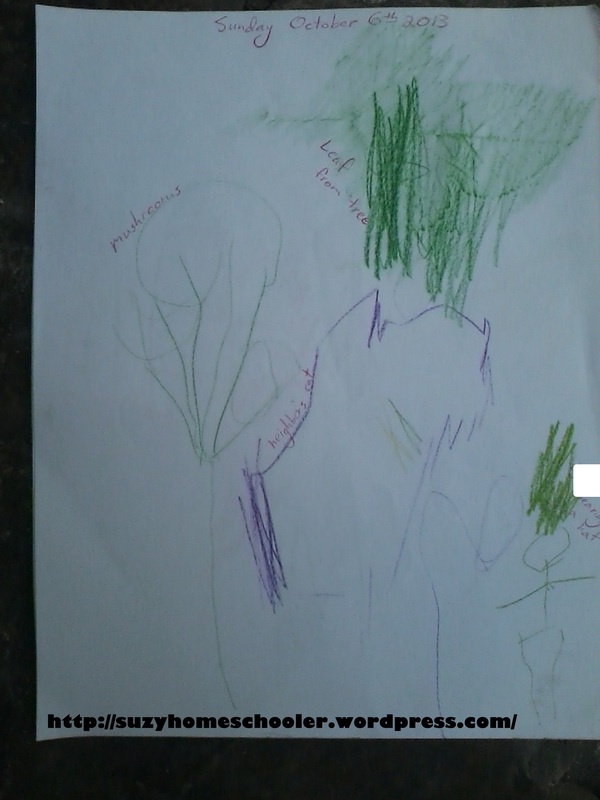 Mushrooms, leaf rubbings, himself, and the neighbor’s cat. Flower, clover, red leaf, and a tree. 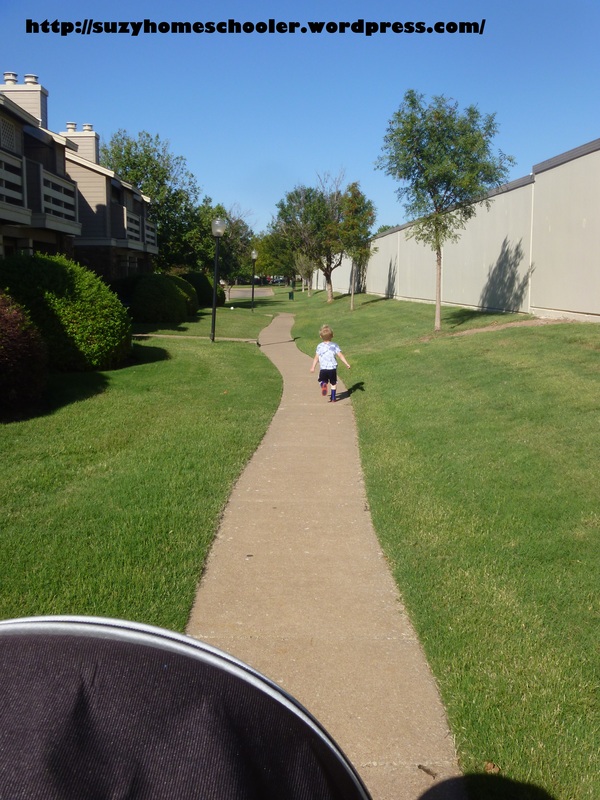 When I first started encouraging LittleMan to nature notebook I thought for sure we’d have to travel to the park every week just to find things to notebook about because I thought there would be nothing of interest around our apartment complex. I was shocked to find that every week we have found something new and fascinating. Little things that we never noticed before. No matter how small the natural space available to you, it is worth exploring. You just may be surprised at how much you find, I know I was. We live in the city too so I was glad to read your suggestions on including nature in our lives. The wildlife we see aren’t exotic and there’s more concrete than grass, but I try to point out different things when we go for walks. 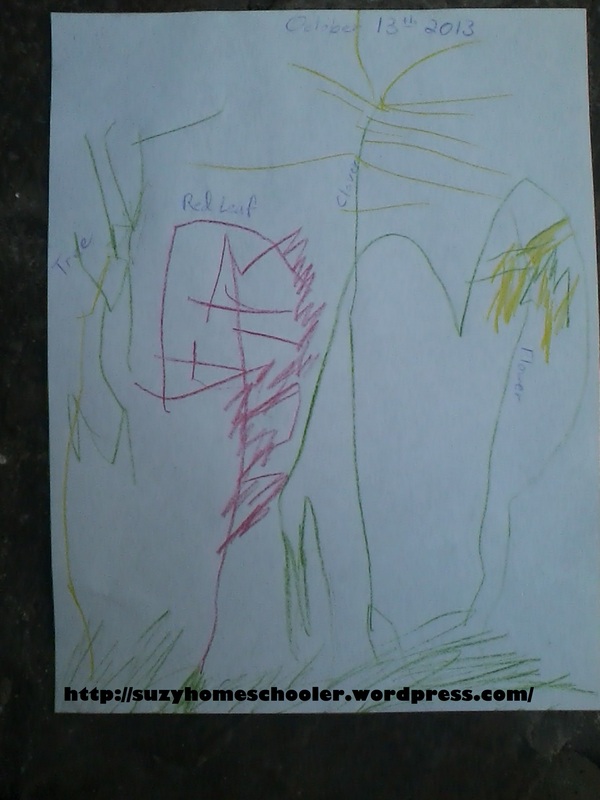 I love your philosophy about letting children explore outside – “Are they hurting anyone? Damaging property? Causing harm to themselves? No? Can they learn from what they are doing? Yes? Then let them be!” Even if you don’t think they’re learning, they just might be! Love those tiny snails! My daughter is obsessed with them! You have some lucky little ones — so glad they get to spend that quality time enjoying the outdoors! Suzy this is such a lovely post! I’m featuring this on my Tuesday Tots post tomorrow. Thanks for linking up. Thank you! Can’t wait to see who else got featured!